Apple appears to have mistakenly updated its iPad User Guide for iOS 8 [Direct Link] with screenshots that divulge details on the company's upcoming iPad updates. The screenshots, designed for Apple's iOS 8.1 update to the User Guide, suggest new iPads referred to as the "iPad mini 3" and the "iPad Air 2" are coming tomorrow. Both tablets are confirmed to have Touch ID support in the guide and the design of the two tablets appears to be largely the same as the existing versions. Rumors have suggested the second-generation iPad Air may be thinner than the original version due to new integrated display, but that is not clear from the screenshots. The iPad Air 2 has also been rumored to include a design that does away with the mute switch, but a rear-facing screenshot is not available to confirm that particular design change. The new mini will, however, continue to have a mute switch. 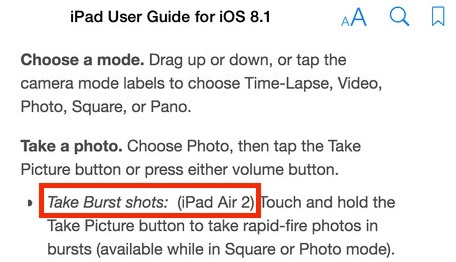 Information included within the guide suggests the iPad Air 2 will be receiving an improved camera with support for Burst Mode images. Apple will introduce the next-generation iPad Air and Retina iPad mini tomorrow, at an event held on its Cupertino campus. Along with Touch ID, the iPad Air is said to be gaining an A8X processor, a new anti-reflective display, and a gold color option. It is unclear if the iPad mini will receive updates beyond Touch ID support as rumors have suggested Apple is aiming to focus on its larger, more popular tablet. Update 11:45 AM: Apple has reverted the screenshots on the listing to match the currently available iOS 8 version of the guide. 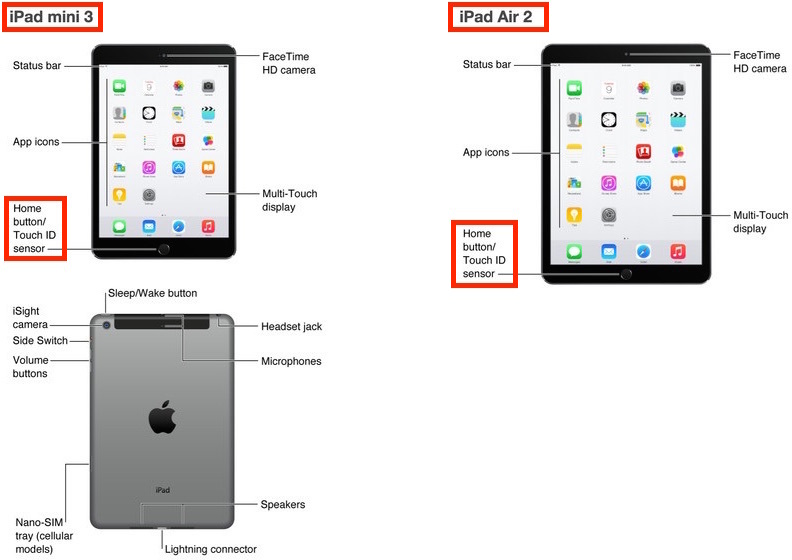 Looks like both new iPads will have multi-touch displays as well. Apple, you've done screwed up iPad naming. I do hope that this is a joke by someone and that they won't use iPad Mini 3 and Air 2 for the names, they just sound wierd. But as long as the Mini gets Touch ID, I'm happy. Will Apple fine itself $50 million?